Preliminary Chart No. 4 of the Sea Coast of the United States from Plymouth Mass. To Saughkonnet River R. I. 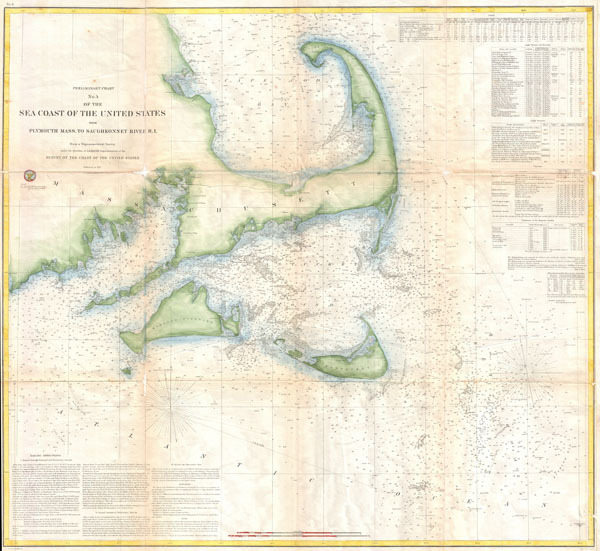 A rare 1857 nautical chart of the Massachusetts coast from Plymouth, MA to Saughkonnet River, RI. Includes Barnstable county, Cape Cod, Nantucket, and Martha's Vineyard. Offers minimal inland detail but a wealth of nautical information including countless depth sounding and notations on the many offshore shoals and other dangers in the region. The upper right quadrant features extensive notations on tides and light houses. Sailing directions appear in the lower left quadrant. Published under the supervision of A. D. Bache for the 1853 Report of the Superintendent of the U.S. Coast Survey. Good. Verso reinforcement and repair on many of the original fold lines. Blank on verso. Right margin extended.